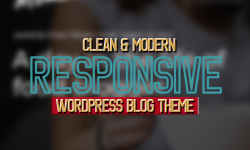 Today we are happy to present you Clean & Responsive Modern WordPress Blog Theme Design that let you build a website without spending a single cent. All WordPress themes are comes with a lot of useful and features and unlimited variations. Patricia is an ultra-clean blog theme. Patricia gives you the ability to let people actually read your content, instead of focusing on all the other stuff that’s going on their screen. With Patricia, you won’t be distracted. Take a moment for the Moment. Unique, Creative, Diffrent…. This Blog will help you step out from the crowd. Moment is a simple WordPress blog theme designed to highlight your visual content in a creative way. Are you into blogging? Here’s the new WordPress theme by Axiom. Spiced Blog is intended for food bloggers, food photographes, cooking and recipes websites. Grand Blog is a clean and minimal WordPress theme for Blog and Magazine web site. Built with the latest WordPress technology. Grand Blog support responsive layout so it looks great on all devices. . Minimal WordPress theme for Blog and Magazine web site. Built with the latest WordPress technology. The theme panel lets you to configure all theme settings, change theme colors, fonts, layout options at ease. Our Theme Panel is packed with powerful options to make your site more unique.